Key findings from our survey of more than 4,800 IT professionals, including salary trends, in-demand skills, job satisfaction, career outlook and more. 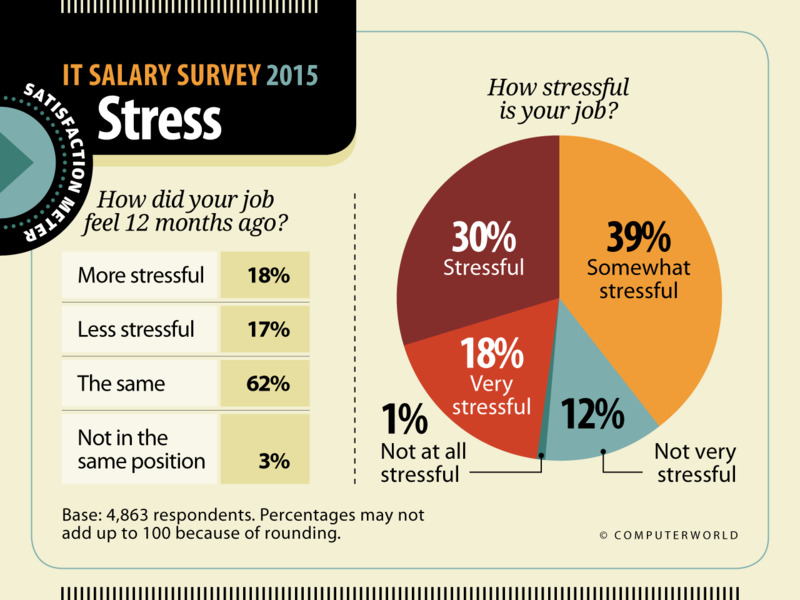 How do tech workers feel about their pay, workloads and long-term career prospects? What are job seekers looking for, and which technical skills are most in demand among managers hiring for IT positions in 2015? 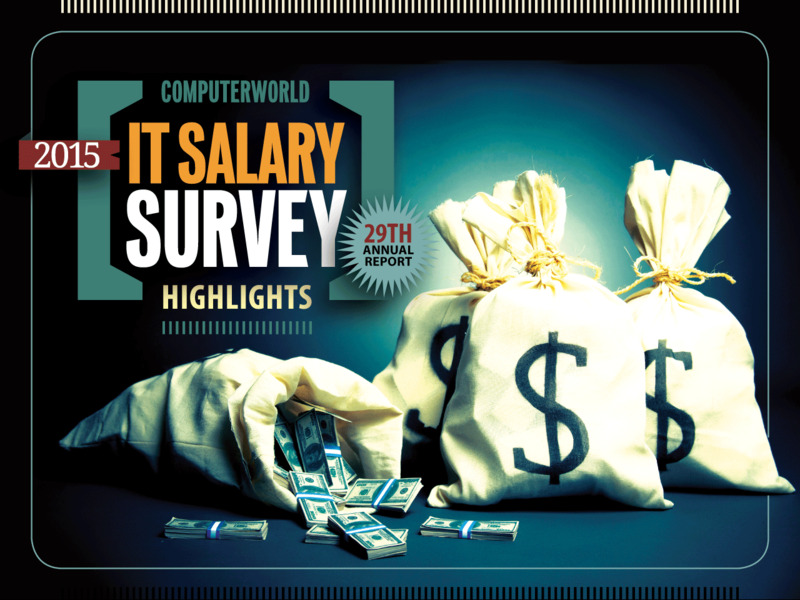 Computerworld's 29th annual IT Salary Survey found those answers and more. We polled 4,863 IT professionals, 99% of whom report being employed full time. Some 47% say they work in management, while 53% characterize themselves as IT staffers. The average age of all respondents is 47. Read on for highlights from the 2015 results, including respondents' thoughts on the state of the IT industry. After several years of slow gains, we're seeing notable compensation increases for IT pros in a range of positions. Average total compensation (salary plus bonus) increased 3.6% in 2015, compared to an average of 2% in the three preceding years. 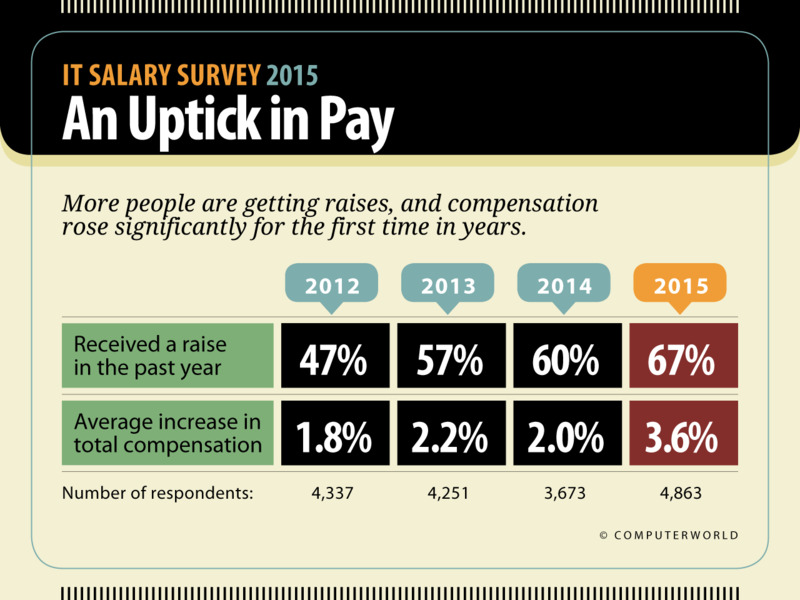 And those raises are spread among more respondents: 67% of 2015 respondents report receiving a salary increase, compared with 60% in 2014, 57% in 2013 and just 47% in 2012. Those who received bumps in their base salaries attribute them to standard salary increases (58%), job performance (36%), cost of living increases (19%), additional/new responsibilities (11%) and internal promotions (10%), among other reasons. The most common types of bonuses received by respondents were annual (29%), performance (25%) and profit-sharing (14%) bonuses. A major factor in the rise in salaries is the increasingly competitive hiring market. Some 43% of managers who responded to our survey say they expect their organization's IT staff head count to increase in 2015, up from 38% in 2014. Of those who are planning to hire this year, 64% say that the majority of open IT positions at their organization are highly skilled specialist jobs, while 31% say the majority of openings are staff or entry-level. Managers note that they've been having a hard time filling open positions in the past two years: 36% say it's taken 3 months to 6 months to fill open positions, while 15% say it's taken more than 6 months. 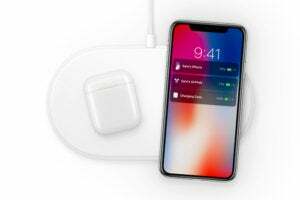 As the job market heats up, some IT professionals are beginning to look around and wonder what else might be out there for them. While nearly half of survey respondents intend to stay put, 6% are seeking a new job within their own organization, 37% are passively looking elsewhere and 9% are actively looking for a job elsewhere. Some 58% of respondents report that an IT-related hiring organization or headhunter has approached them about job opportunities in the past year. 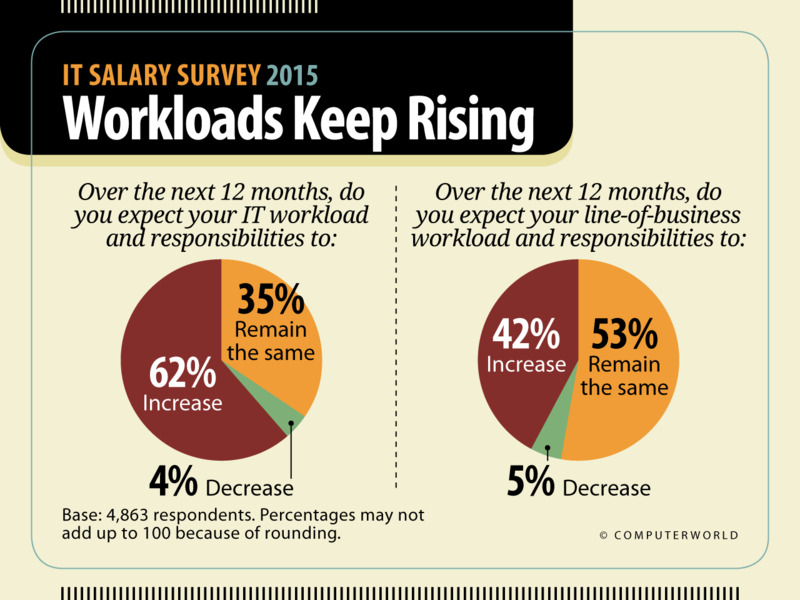 No surprise: Money is a big motivator for IT professionals. 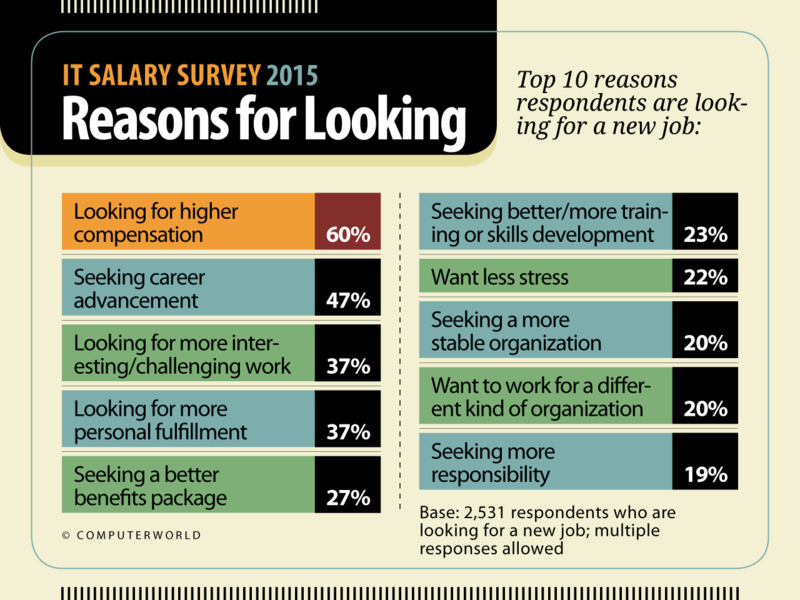 Among survey respondents looking for a new job, 60% say they're motivated by higher compensation. 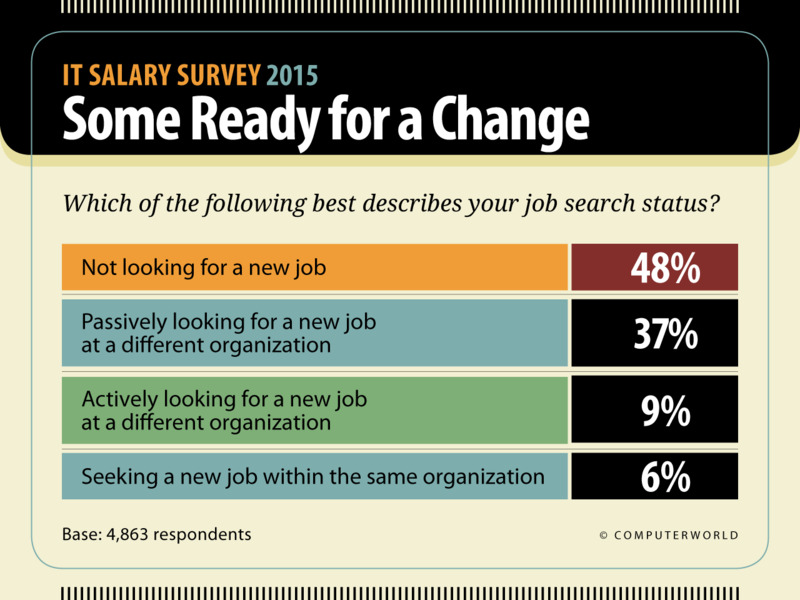 And 74% of all respondents — not just those looking for a new job — say a salary increase would entice them to change jobs. Many job hunters also say they're seeking career advancement, more interesting or challenging work and/or more personal fulfillment. 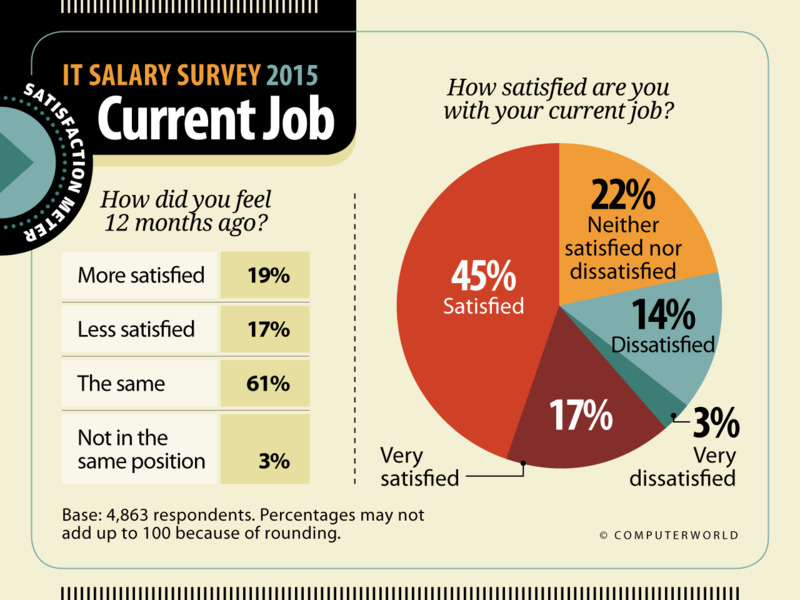 Despite rising salaries and bonuses, only about half of survey respondents (52%) report they are satisfied or very satisfied with their total compensation, while one quarter say they are dissatisfied or very dissatisfied. 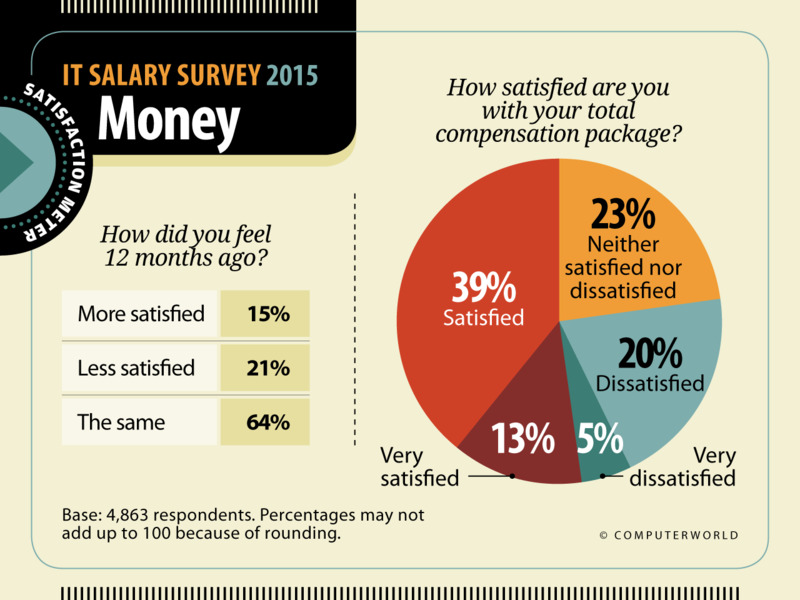 When asked how they felt about their compensation 12 months ago, 15% said they were more satisfied back then, while 21% were less satisfied with their pay a year ago. Just 22% of respondents feel that their salary is keeping pace with business growth and demands. And when asked if they think they are paid fairly, 54% say they are underpaid based on their roles and responsibilities — up slightly from 52% in 2014 and 51% in 2013 and 2012. In terms of overall financial picture, more than one third (39%) of our respondents feel that they have stayed flat over the past two years of their career, 35% believe they have gained ground, and 26% feel they have lost ground. A solid majority (62%) of respondents report being very satisfied or satisfied with their current job, although 19% say they were more satisfied 12 months ago than they are now. And their near-term career outlook is quite positive: When asked where they expect to be in their career five years from now, 52% of respondents predict they'll be in higher-level positions, either with their current employers or at new organizations, 31% think they'll still have their current job or a similar job at another company, 14% expect to be retired or self-employed, and 3% say they'll have left the IT profession altogether. 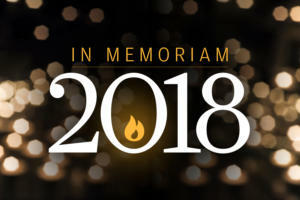 In contrast, just 37% of the 2014 survey respondents said they expected to move up the ranks within the ensuing five years, while 41% thought they would still have their current job or a similar job at another company. 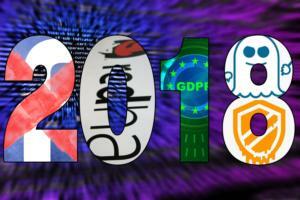 As the economy has improved and the demand for skilled tech pros has heightened, the percentage of respondents who feel secure or very secure in their jobs has inched up, from 57% in 2012 to 63% this year. However, 20% of respondents report that they felt more secure in their jobs 12 months ago. Overall, the percentage of respondents who feel their job is stressful or very stressful has risen slightly, from 46% in 2014 to 48% in the current study. That's not surprising, since 85% of survey takers say they've felt pressure to increase productivity, take on new tasks, or both — and only 12% say their salary has been adjusted to compensate for the added workload. Long hours are the norm, with an average 47-hour workweek among respondents. 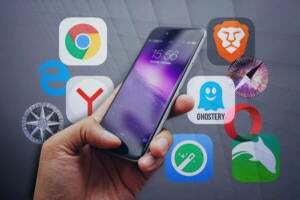 What's more, 57% report frequently or very frequently checking messages or communicating with their offices during non-scheduled work hours such as evenings, weekends, holidays or vacation days. IT pros don't see an end to the piling on of duties. Some 62% of respondents say they expect their IT workload and responsibilities to increase over the next 12 months, while 42% expect their line-of-business workload and responsibilities to rise in the same time period. Indeed, 53% of respondents cite increased IT workload as a factor negatively affecting their working conditions, followed by understaffed projects (33%), budget cuts (32%) and unfilled open positions (25%). 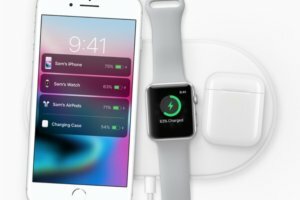 Staying relevant in the workplace is top of mind for many tech pros. When asked about the biggest challenges facing IT workers today, 20% cite keeping up with technology advancements, followed by the alignment of IT with the business and undervaluing older workers. When it comes to their own careers, respondents' top concerns are keeping their skills up to date/being valuable to their employers (24%), stagnant salaries (15%), finding appropriate positions for their skill sets (13%), increased workloads (11%) and the changing structure and role of the IT department (11%). When asked what types of training they find most beneficial to their career advancement, 64% of respondents cite training in specific technologies, followed by IT certification training (43%), leadership training (30%) and project management training (28%). 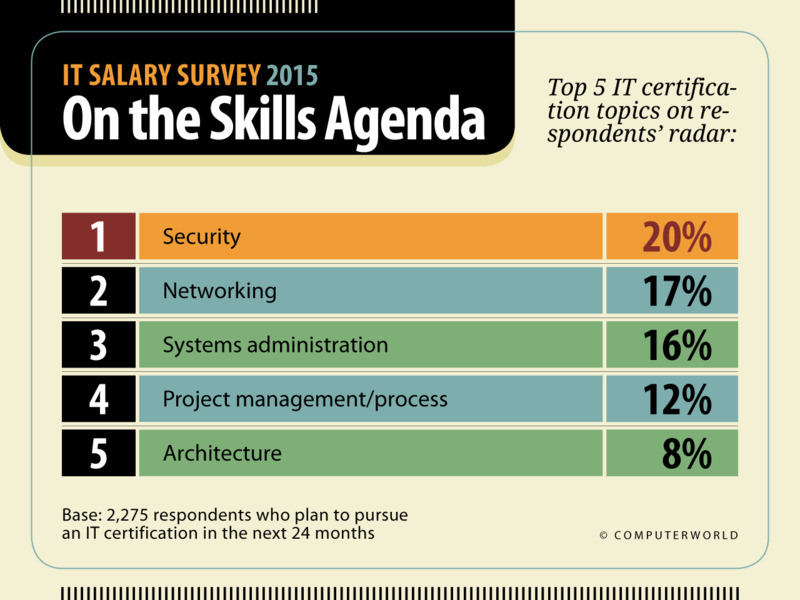 Just under half (47%) of survey respondents plan to pursue an IT certification in the next 24 months. Among those respondents, 20% say they intend to go after a security certification, followed by 17% choosing networking and 16% systems administration. Overall, respondents view a career path in IT as slightly more secure than other career paths: 50% feel it is more secure than most career paths, while 40% feel it is as secure as most other career paths. In the end, the vast majority of IT pros are happy with their career choice: 84% say they're satisfied or very satisfied with their decision to pursue a career in IT.